There is no shortage of absolutely amazing and beautiful birds in New Zealand. It is hard for many to pick a favorite. But, the one that topped the list for the bird of the year for 2017 is the Kea. The Kea is a bird that belongs to the parrot family and has chosen to make its home on the South Island of New Zealand. 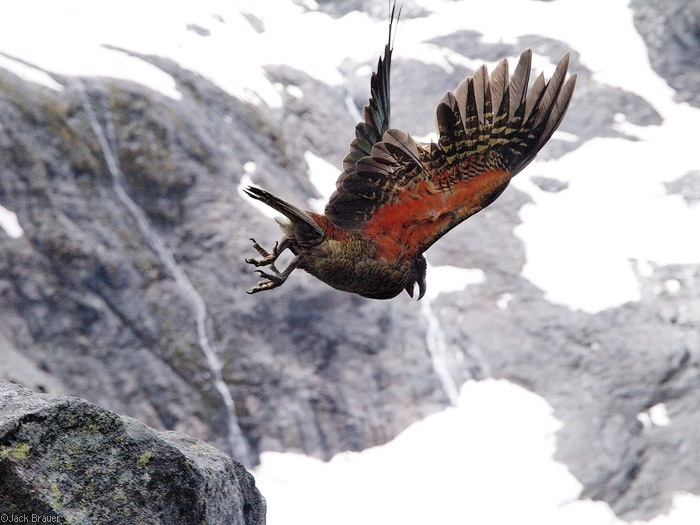 What Does the Kea Look Like? Although many do think of parrots generally being a collection of color the Kia is mostly green. Which makes its brilliant orange found under the wings all the more astounding. It is a large species of parrot which can make it look quite intimidating compared to other bird species. What Makes the Kea Special? Most every bird has something that makes it special but with the Kea, many would have to say it’s the bird’s temperament. It is known for being quite naughty which in turn makes it entertaining. The Kea can be quite a thief as well as it loves to hang around where the tourists are and then help itself to some small objects that it is able to carry. Another favorite past time is to be able to peck away at some of the rubber components found on vehicles like the seals around the mirrors or windows. The Kea has a trusting nature towards humans and this can make it vulnerable. With the Kea being such an interesting bird making sure that their species is going to survive has become a priority for some naturalists. It has been noted that less than 40% survive their first year. This sets the mortality rate high for the offspring. Keeping the Kea as a pet is not considered to be a good idea as they do not do well in captivity as they are a bird that belongs to a flock.